This massive Arthaus Musik set was compiled from performances given to mark the 125th anniversary of the birth of Prokofiev and, incredibly they took place, with the exception of one work, over just two days, in two locations! The concerts began in Moscow on the morning of April 23, 2016 and continued later that day in St. Petersburg, eventually finishing there the next day. Because there are twenty major works here and a full-length movie, I will be as brief as possible in my summations, though a few works must be given greater attention, like the often misunderstood October Cantata. Right off, let me say the sound reproduction is excellent in all performances, and both the camera work and picture clarity are first rate on these Blu-ray discs. This release is also available on DVD. The timings provided for each composition below include an introduction, Gergiev’s entrance onto the stage, and applause at the end, increasing the length by three to five minutes in each work. Thus, my comments about tempo may sometimes seem at odds with the stated duration. The works are presented in roughly chronological order on the discs, exactly as I have them listed below (using Arthaus’s titles to define the periods of composition), but I’ll cover them according to genre, beginning with the symphonies. The Classical Symphony is one of those works that seem nearly always to get a good performance. Gergiev and company turn in a fine effort, though I think his breakneck tempo in the finale is a bit too fast. His LSO/Decca performance was much the same. Still, this new account is very good and should satisfy most listeners. The Second Symphony also gets a fine performance here, a better one than in Gergiev’s LSO cycle. For one thing the development section of the first movement is better shaped by Gergiev, the motoric climax not sounding like a machine stuck in first gear as in the Decca account, but proceeding with crushing intensity. The second movement theme and variations is by turns colorful and intense and it’s well played, thus making this overall an excellent Prokofiev Second. Gergiev recorded this work one other time that I’m aware of, in Russia with the Moscow Radio & Television Large SO, which I have not heard. Gergiev’s account of the Third Symphony is not significantly different from his LSO version. Tempos are on the brisk side as before and there is a white-heat thrust to the character of the first, third and fourth movements, quite appropriate for this fiery work—I say fiery because it is derived from Prokofiev’s opera, The Fiery Angel. Even the slow second movement (Andante) goes by at a pretty good clip. Overall though, this is a most effective account of this dark and mysterious work. The Fourth Symphony here is better than Gergiev’s version with the LSO as well as his recent performance on the Mariinsky label. The main reason is that Gergiev delivers a somewhat slower and more sensitive account of the first two movements. Only the later Op. 47/112 Fourth is given in this set, whereas the Gergiev/LSO contained both versions. But the early version is probably the least effective Prokofiev symphony and Gergiev’s new rendition of the later one here is excellent. This is the fourth recording Gergiev has made of the Fifth Symphony: his LSO, Vienna Philharmonic/Euroarts (video), and earlier Mariinsky efforts being the other three. This is arguably the best Fifth of the lot in its more measured and sensitive character. The LSO and Vienna accounts, though well played, are significantly faster, too much so in certain passages. This new effort is similar to his 2014 SACD on the Mariinsky label, but marginally better. The Sixth begins with a transparent and delicate rendering of the main theme, allowing you to hear its innermost details. Detail remains rich throughout the performance, though I think the trumpet is a little too prominent in the main theme of the second movement. The finale is taken very briskly, faster than Gergiev’s LSO and other recent Mariinsky version, faster than I’ve ever heard from anyone, in fact. But he largely makes it work, imparting a sense of excitement and agitation. A fine Sixth then. Gergiev’s view of the Seventh has actually changed rather little, as his LSO and earlier Mariinsky account are not significantly different from this one. Gergiev has always phrased the plentiful lyrical music in this symphony effectively, not shrinking from its lush Romantic character, but playing it up for all its poignant beauty. The second movement goes well, despite a late entry from the piano midway through, and the remainder of the work is most effective. Now, as a set how does this one fare against the competition? Prokofiev symphony cyclists are, in rough chronological order: Rozhdestvensky/Melodiya, Martinon/Vox, Weller/Decca, Kosler/Supraphon, Neeme Järvi/Chandos, Rostropovich/Erato, Ozawa/DG, Kuchar/Naxos, Kitayenko/Capriccio, Ashkenazy/Exton, Karabits/Onyx, Alsop/Naxos, Gaffigan/Challenge Records, Litton/BIS, Vladimir Jurowsky/Pentatone and the aforementioned Gergiev/LSO and of course this new Gergiev/Mariinsky set. Some of these are still ongoing projects, like those of Litton and Jurowski. I don’t have the Ashkenazy set (but have heard some of it) and I missed one disc each of Rostropovich and Gaffigan, but I believe I have everything else listed here. As alluded to, Gergiev seems also to have yet another cycle going on the Mariinsky label on SACD, having recently done Nos. 4, 5, 6, and 7, all of which I also have. So, who takes the prize in Prokofiev’s symphonies? The best, not necessarily in this order, are Kitayenko, Alsop, Gaffigan, and Gergiev (I’ll give this new set a slight edge interpretively over the LSO set, though the latter features slightly better orchestral playing). So, it’s a very tight race, a little too hard to call. If you want a video set of the symphonies, Gergiev’s new one is the only game in town and a very excellent choice. Of course, one could assemble an outstanding set of Prokofiev symphonies from individual performances: Karajan/DG in the First; Alsop and Karabits in the Second; Muti/Philips in the Third; Alsop, Litton, and Ormandy/Columbia in the Fourth; Bernstein (NY Phil)/Sony in the Fifth; Kitayenko and Gaffigan in the Sixth, and Tennstedt/Profil and Nikolai Anosov/Supraphon in the Seventh. Here Gergiev could be included among outstanding versions in the Fourth, Seventh and perhaps the Second. Now the concertos… The Prokofiev First Piano Concerto gets a sparkling, witty performance from 2010 Queen Elizabeth Competition winner Denis Kozhukhin. With moderate tempos, a wide range of dynamics, and a very sensitive grasp on the lyrical side of the music, he delivers a better performance than most others, including Argerich/EMI, Ashkenazy/Decca, Boris Berman/Chandos, and maybe even Richter/Melodiya, whose poor 1953 sound reproduction doesn’t help his version. At least for now, Kozhukhin’s rendition is my preferred Prokofiev First. Russian pianist Denis Matsuev, winner of the 1998 Tchaikovsky International Competition, delivers a Prokofiev Second high on power, excitement and flash. But of course, there’s more to this dark concerto—the work was written in the wake of the suicide of Prokofiev’s conservatory friend, pianist and fellow student Maximilian Schmidthof. Not that Matsuev is insensitive in his playing—he phrases the haunting first movement main theme very beautifully and plays the lyrical alternate theme in the finale quite nicely. But Matsuev’s steely tone and powerful, all encompassing technique sometimes bulldoze over some of the more subtle aspects of this work: the first movement’s alternate theme lacks wit and the big first movement cadenza, impressively played though it is, aims more toward Lisztian flash than Prokofievian tragedy. Still, Matsuev is utterly thrilling and very colorful in this titanically difficult concerto—you won’t ever be bored with him. Yuja Wang/DG, Ashkenazy/Decca, Horacio Gutierrez/Chandos and others deliver somewhat deeper accounts, however. Russian pianist Sergei Redkin was previously unknown to me: he won the 2013 Prokofiev International Competition and was third prize winner at the 2015 Tchaikovsky Competition. He plays the Prokofiev Fourth with wit and style, imparting a generally light touch in the outer movements, which is wholly appropriate, and delivering the lyricism in the second movement with great sensitivity. He deftly captures the shifting moods—the sweet and sour character—of the colorful third movement in proper proportion. Serkin/Sony, Ashkenazy/Decca, and Bronfman/Sony have recorded fine performances of this work, but maybe only Serkin’s is clearly better than Redkin’s. Ukrainian-born Vadym Kholodenko, winner of the 2013 Van Cliburn Competition, plays the difficult five-movement Fifth Concerto with utter confidence. He brilliantly captures the athletic verve of the opening movement, with its spastic leaps in the main theme and mixture of energy and muscle throughout. He effectively conveys the wit of the second movement march and the breathless playfulness of the Toccata. He plays the remaining movements just as convincingly. This performance is compelling enough to stand with the better accounts of the concerto, by Richter/DG, Ashkenazy/Decca and Boris Berman/Chandos. Greek violinist (and conductor) Leonidas Kavakos turns in an excellent performance of the First concerto. He makes the dreamy character of the first movement main theme sing beautifully and captures the menace and playfulness of the alternate theme so well. He conveys the energy, wit and acid in the ensuing Scherzo with a natural feel for Prokofiev’s kaleidoscopic imagination. The finale is pure magic, the main theme beautifully shaped, the alternate one bouncy and energetic, and the ending utterly mesmerizing, as the first movement melody comes back and soars to the heavens. Szigeti/Naxos, from 1935, is very good with even decent sound for its time, and there are also Oistrakh (several recordings) and Mutter/DG with great accounts of this concerto. But Kavakos is very nearly on their inspired levels. Hungarian Kristóf Baráti won the 2010 Paganini Violin Competition in Moscow. His is one of the more unusual performances of the Second Concerto I’ve ever encountered: Baráti takes a rather mellow approach, pointing up the work’s plentiful lyricism and employing a very delicate tone much of the time, rarely attempting to get a big sound out of his instrument. It’s a lyrical, less aggressive account that will appeal to those favoring a more post-Romantic approach to the several lush melodies in the work. Arabella Steinbacher/Pentatone, Vadim Gluzman/BIS, Janine Jansen/Decca and Kyung-Wha Chung/Decca would be my preference, though Baráti makes a strong case for his way with the work, drawing plentiful applause from the audience at the end of this performance. I never cared strongly for either version by Heifetz, well played though both are. Russian cellist Alexander Ramm, second prizewinner at the 2015 Tchaikovsky International Competition, delivers a very convincing account of the Symphony-Concerto for Cello and Orchestra. He has a strong, sinewy tone and can float a singing line of mesmerizing charm. In the first movement he phrases the main theme with a sense of urgency in his slightly brisk tempo, imparting a darker, more agitated character. He tends to emphasize the emotional highs and lows with deft accenting and a full range of subtly applied dynamics. His pizzicato playing is very robust and he can slash away with a sense of thrust or show balletic grace, as in the menacing but witty second theme in the second movement. His finale is wonderfully shaped and his ending thrilling. Rostropovich/EMI (with Sargent) is hard to beat in this work, but its older sound may be a deterrent for some. Ramm’s effort is at least competitive with the better more recently recorded ones. As for the choral fare… Seven, They are Seven is an early work of about eight minutes duration, a rather enticingly weird piece for tenor, chorus and orchestra. It takes you to a primitive world, where chants and rhythms seem to invoke evil spirits. Its text is by Konstantin Balmont and it was inspired by an ancient Chaldean exorcism. It has rarely been recorded: I have found and acquired only one other version, that by Rozhdestvensky, from 1968. I’ll give the edge here to Gergiev, who really delivers an intense and powerful account. Tenor soloist Igor Morozov is vocally and dramatically quite impressive. The Cantata for Twentieth Anniversary of the October Revolution is a veiled satire of the things it purports to celebrate, but in this performance the veil is somewhat lifted. To those unfamiliar with the work, let me describe some of the more significant satirical and musically important moments. The non-choral first movement, A Spectre is haunting Europe, the Spectre of Communism, is not just disruptive, as you might expect, but heavily percussive, dark and violent, in the end seeming to depict a sinister force lurking about Europe instead of a supposedly liberating movement. The ensuing panel, The Philosophers, has the chorus singing a lively upbeat chant without clear direction, but then a beautiful, heavenly anthem is sung above it seeming to bring order for the moment. But the rhythmic vocal underpinning gains strength and continues on its own course, as if vying with the melody rather than uniting with it. In Revolution, No. 6, all hell breaks loose in the second half, the highly percussive and heavily scored music seeming to portray chaos and anything but heroism and ultimate triumph. Near the climax Lenin’s words are typically called out through a megaphone from the stage, but here, in a deftly witty stroke, an actor dressed as and made up to look like Lenin appears on a balcony and shouts out his pronouncements with fanatical, voice-cracking earnestness, a number of audience members reacting with obvious amusement. The movement ends not triumphantly as you would expect but as if staggering, wounded, defeated. In No. 8, The Oath, the music takes on a sacred air much of the time. Here Stalin (who had once studied for the Russian Orthodox priesthood) stands at Lenin’s tomb and praises the deceased leader, practically elevating him to sainthood as he speaks of Lenin’s “commandment” and uses such other (religious?) words as "vow" and "devote". A little irony here too? Well, I think you get the picture. There’s much else in the work that is satirical, but I must point out that the music in this masterful score can be heard divorced from the text and thus enjoyed for the thrill and beauty of its notes. The performance here is excellent. There are other recordings by Kondrashin/Melodiya (shorn of Nos. 8 & 10 for 1960s-era Soviet political reasons), Neeme Järvi/Chandos, Mark Elder/BBC Music, Alexander Titov/Beaux Authentics and Kirill Karabits/Audite—not to mention two by Gergiev on video and available on Youtube (one with the London SO and the other with the Rotterdam Philharmonic). But this new one by Gergiev and company is clearly one of the stronger efforts, perhaps the very best. Despite tempos in movements 7 and 8 that are a bit too brisk, it’s still overall a superb effort, with plenty of detail you won’t hear in other recordings, excellent playing by the orchestra and topnotch singing by the chorus. For this performance alone, I would want this set. This Alexander Nevsky is a very good one. Gergiev recorded the work once before, when his orchestra was called the Kirov, its Soviet-era name which changed in 1992 back to Mariinsky. The highlight of this performance is the very intense and exciting Battle on the Ice, which is the longest and most crucial of the seven movements. Orchestral playing is brilliant here and the singing by the chorus is very fine. Olga Borodina sings an impassioned and beautiful Field of the Dead. Abbado/DG, Reiner/RCA, Ormandy/RCA and others have produced excellent accounts of this work, but this one stands in their company. Gergiev’s Ivan the Terrible is the Abram Stasevich arrangement of the music Prokofiev provided for the two-part Eisenstein film. It contains narration—in Russian—and often the narrator speaks over the music. Some conductors (Slatkin/Vox) have recorded this music without narration, or used a similar version, like Christopher Palmer’s (Neeme Järvi/Chandos), that eliminates narration, and these are arguably more effective. The performance of the music here is top-notch, and if you prefer a narrator, the one used here, Alexei Petrenko, would be my first choice. He is dramatically very effective, even if he gets a little carried away now and then. Gergiev’s tempos always seem right and he masterfully captures the kaleidoscopic character of the score with all its grandeur, glitter and gloom. On to Kazan, to cite just one number here, is so beguilingly perverse in its crass grimness, the tubas singing determinedly and profoundly from the bowels of darkess. The vocal soloists, Yulia Matochkina and Mikhail Petrenko, are excellent. Gergiev’s version here is just as good Stasevich’s pioneering effort on Melodia, as well as the Muti/EMI version. The Scythian Suite is the only one-of-a-kind work here: it is not a symphony, concerto or choral piece, but has origins in ballet, the unrealized Ala and Lolly. Gergiev recorded it twice before, once on CD (which I haven’t heard) and once on video (Kultur), with the Rotterdam Philharmonic, which I possess. This new account is very fine, beginning with a most savage statement of the main theme and moving on to a very atmospheric and dreamy rendering of the subdued but ominous flute melody. The second movement is appropriately barbarous and powerful here, while the third follows with contrast in its subdued but seething mystery before it finally erupts ferociously. The finale is colorful and brimming with energy, the ending all-conquering and triumphant in a most primitive and crushing manner. An excellent performance then, one that easily ranks with fine past efforts by Scherchen/Westminster (from the early 1950s but with decent sound), Abbado/DG, Previn/Philips and Litton/BIS. The playing throughout this set by the Mariinsky Theatre Orchestra is very fine. I earlier mentioned a flub in the Seventh Symphony and there are a few others too, most noticeably from the brass. Yet in a marathon setting such as this, their performances are comparatively excellent: few orchestras could play with their general precision and commitment in such a massive undertaking over just two days. Even when there is a mishap, you may not notice unless you’re very familiar with the score. Prokofiev: On the Way is a ninety-minute documentary film in Russian with English subtitles only. 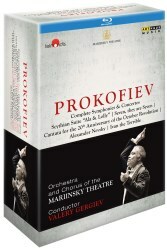 It features actor Konstantin Khabensky expressing Prokofiev’s thoughts and ideas, and also contains much commentary by Gergiev about Prokofiev. There are excerpts from many of the composer’s works as well as rehearsals of them, often with different artists from those featured elsewhere in this set. The film is interesting in its probing into Prokofiev’s mind, his opinions and reactions to events. Sometimes the film seems a little chaotic in its presentation of happenings and commentary, but overall it is fascinating and provides the viewer with a good if limited biographical sketch of the composer and his mindset, and also shows us nearly as much about Gergiev. This Arthaus Musik package comes in a large box and also includes a nearly 100-page hardcover book with photos, an essay on Prokofiev by Gergiev, notes on the music and detailed information on the performances and soloists. This set is a must for Prokofiev mavens, as well as for admirers of the indefatigable Valery Gergiev, the driving force behind this marathon event. Others with an interest in 20th century music will find much here of great interest as well. Prokofiev had an audacious imagination, a clever wit, a tendency to shock, and an ability to spin the most catchy and beautiful melodies. He wrote masterpieces in every major genre: opera, ballet, symphony, concerto, song, chorus, solo instrumental, chamber, children’s music, film scores, and even military band music. Prokofiev was a highly versatile composer to say the least, and this Arthaus Musik set is a monument to his exceptional art. While performances in this recording warrant strong consideration for a recommended tag, the limited availability for a new release – several retailers show it as already out of stock – and more significantly, the exceptionally high price for 4 discs (in excess of £150 at Amazon UK) preclude its selection. Tchaikovsky Concert Hall, Moscow, Russia – Opp. 10, 19, 20, 25, 30, 40.